Roughly 250 years ago, Madame Anna Colas Pépin presided over what has become one of the most notorious links in the French slave trade in Senegal. Now, University of Virginia architectural history professor Louis Nelson is part of an international team working to restore Pépin’s home and share its lessons with generations of Senegalese schoolchildren and tens of thousands of international visitors. Known as the “Maison des Esclaves” (“House of the Slaves”), the house sits atop the beaches of Gorée Island, just off the coast of Senegal. For decades, it has served as one of Senegal’s most important museums, with thousands of tourists and Senegalese schoolchildren visiting the dank basement rooms that once held imprisoned Africans awaiting a treacherous journey across the Atlantic, known as the Middle Passage. Of the estimated 15 houses that served a similar purpose, the Maison des Esclaves is one of only five surviving, and the only one preserved for historical study. 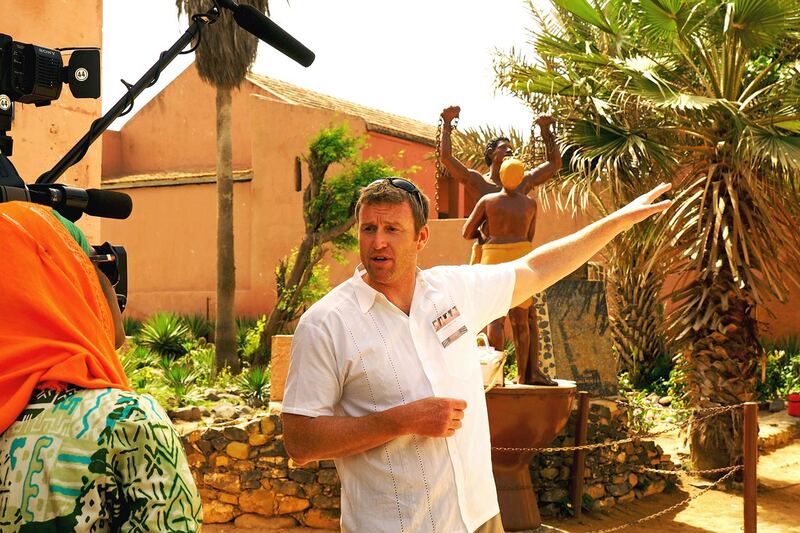 “It is an incredibly important historic site, especially for the Senegalese schoolchildren as they are grappling with the historical implications of slavery in Senegal and the legacy of the Middle Passage,” Nelson said. The team of African and American scholars is working to expand the museum under the direction of Sites of Conscience, an organization dedicated to preserving physical sites as reminders of past atrocities. As a result of Nelson’s partnership, UVA is one of the first universities to become a member organization under the direction of the International Coalition of Sites of Conscience, as it grapples with its own history as a site of slavery. Nelson has spent years researching and restoring sites related to the slave trade and studying slavery at UVA as part of the President’s Commission on Slavery and the University. In Senegal, his team is expanding the educational offerings of a house that has become a prominent symbol of one of the darkest periods of the country’s history, marked by not only the enslavement of Africans by Europeans, but also the capture and sale of Africans by other Africans. “Unlike the English slave trade from what is now modern Ghana, where an English corporation controlled the castles and factories used to prepare Africans for the Middle Passage, Africans sold into slavery from what is now Senegal were actually provided by other Africans,” Nelson said. Pépin, the house’s owner, was part of a class of mixed-race women who oversaw the slave trade on Gorée Island. These women, known as signores, were typically daughters of French slave captains and African women. They could inherit wealth and property, and many used that power to buy and sell slaves, along with other goods bound for Europe and the Americas. Nelson and his African colleagues are tasked with conducting additional research on Pépin and her associates to help schoolchildren and tourists better understand how the slave trade functioned at a local level. To create more educational space, the Sites of Conscience team has proposed relocating many museum functions – such as ticketing and administration – to an 18th century house across the street that the Senegalese government recently donated for that purpose. That space will also house an exhibition detailing the broader history of the Middle Passage, as well as rooms for students and teachers to gather and talk about what they have seen. Moving all of those functions to the adjacent lot frees up space in the Maison des Enclaves to further educate visitors about the history of Madame Pépin and her operation, which Nelson and his scholars will continue researching over the coming year. “I think it is worthwhile to particularize this building and help people who come to visit the site not just to think about the transatlantic slave trade in the abstract, but to think about the particular realities, the spaces and processes of the trade, and why certain individuals made choices to do this,” he said. The team is also considering a partnership with the Gorée Institute Centre for Democracy, Development and Culture in Africa, a civil rights organization that could help museum visitors draw connections between the legacy of slavery and modern political and social justice issues. The work in Senegal is similar to Nelson’s study of slavery at UVA. Last year, he led a field research class that had students crawling through the attics and basements of the Academical Village to discover and interpret evidence of slaves’ lives in the 19th century. Fellow faculty member Andrew Johnston, director of UVA’s Historic Preservation program, then led students in digitizing and sharing their findings. Difficult as uncovering these fraught pasts may be, Nelson firmly believes that remembering and studying a painful past inherently makes a community stronger, whether in Senegal or at UVA.